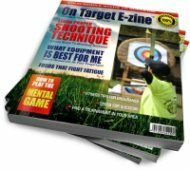 On this page you will learn about the anchor, which is the sixth basic archery step of the shot sequence. In this step you will learn how to use your index (first finger) of the drawing hand as a point of reference for your anchor. This basic anchor position is recommended for beginning archers because it is easiest to learn and produces consistent results when performed correctly. Archery is a sport of and accuracy and the anchor position is your key to shooting consistent tight arrow groups time after time. • Drawing Arm: Is your draw arm elbow placed behind the arrow? - Your forearm should be parallel or in-line with the arrow shaft. - Your shoulder should be rotated down and back. 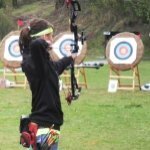 • Grip: If you find it necessary to reposition your grip you should carefully let-down the bowstring and begin the process over. Draw the bowstring back toward the side of your face the remaining distance until the tip of the index finger can be placed on the corner of your mouth. Point your thumb down in to the palm of your hand. The thumb should be tucked in to the palm but relaxed at the same time. Fold your little finger toward the palm of your hand. Keep the finger relaxed. Now press your hand snug against the side of your face. The index finger should be on the corner or crook of your mouth. The anchor must be solid - Many new archers "float" the anchor meaning they do not have firm contact with the bowstring hand against the side of the face. Note that the bowstring should be located just off the side of your nose. You should be holding the full draw weight of the bow in this step. Some archers are afraid of the bowstring being to close to the face and consequently they cannot achieve a consistent anchor position. I call this a floating-anchor which is actually an oxymoron. An anchor simply cannot float and be effective at the same time...so for our purposes the term floating-anchor is very applicable. Make a mental note of where you position your index finger near the side of your mouth until you find a comfortable place that you will use every time you anchor. Have A Question About The Anchor Step?